I swore I had the NodeMCU running on WiFi before, but after uploading new code (not new ESP8266 firmware either) that accesses the wifi library, I got crazy output on serial monitor. Basically it was an exception and a stack dump (I needed Imodium for my NodeMCU!!) that repeated after any call to the wifi code in library. I originally had the 2.2 version of ESP8266 source and library and removed it and got latest build at 2.3 for Arduino. This all done through the ‘Board Manager’ built-in to Arduino IDE. I also tried adding WiFi.disconnect(true); before calling any wifi code. The stack dump continued and I got nowhere. I tried changing boards and tried all ESP8266 varieties to no avail. Then I did a search on all exceptions and found that a workaround for a (2) exception was to add WiFi.persistent(false). I’ll be a monkey’s uncle! That did it. So, WiFi.disconnect(true) by itself did not solve the problem….persistent(false) did. That code above did the trick. I had some time to go over the changes that new update to LuxRender has unleashed. I am very happy and impressed. I have been avoiding LuxCore API, as previously mentioned, mostly because node implementation was incomplete. The gaps have been closed and materials all seem to work in nodes. There are a few things that may be not implemented at this writing, such as ‘Energy Conserving’ on Matte translucent material, etc. It may be there with Python, but the node GUI does not show it. Updating my Converter Code is complete and currently testing with various models and scenes. The speed of LuxCore 2.7 blows away the Classic API modes with my 3D modeling rig. I had to update my AMD video card to catalyst 15+ or ‘Crimson‘ to get it to even go beyond freezing up in OpenCL. I can get it to work with LuxCore now, but not all settings complete. I haven’t nailed down the best settings to get it to complete a render at all times. Right now I am getting very fast renders with using CPU settings only. 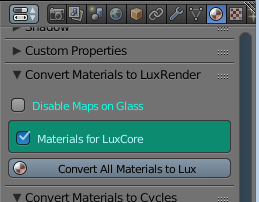 So far, my favorite render settings in LuxCore are Path engine and Metropolis sampler. Pulled back the consecutive rejections to 425, with a Power light strategy. I use 6 out of my 8 cores and let ‘er rip. I am using a fairly large scene for testing with gobs of materials. Yes, that is what I am playing with. If my Converter does not blow up on that, then I can release it into the wild. That scene has helped in many ways for correcting and updating code. It caught lighting conversions I overlooked in some of the simpler scenes I was testing with. This also has a skydome, which I switched to a hemi HDRI light after conversion. I am still testing, especially the different LuxCore settings. In the meantime, I have uploaded the new updated Converter, which is now version 1.6 here. Hacked by Plug-In, no doubt……….. I have finally got to point where this site is back online. I have not devoted much time to re-applying WordPress and uploading content. About 4 months ago, this site was overtaken and infected its way to the DNS servers. Typing in the link to this site brought you to a Chinese Yacht club site. Anyway, the domain name issues are corrected and the content has been purged and cleaned. The last bits will be updated and corrected in a couple of days, as I finalize media links, etc.